Suffering from dark circles or puffiness around your eyes? Our eyes are more than just a window to the soul and are often a real giveaway to our over all health. Stress, tension, insomnia, artificial bright lights, sun exposure, overworking and anxiety are all causes of damage to our eyes, making them feel strained and tired, which often comes out as dark circles, puffiness and fine lines. Dark circles can be caused by any number of other factors, like poor diet, loss of collagen or fat, pigmentation, thinning of the skin, allergy or rubbing or scratching the eyes. Puffiness can be caused by water retention, lack of regular exercise, alcohol, sinus infections, salty foods or protrusion of the fatty pad underneath the eye. Here at Mary Ann Weeks Aveda Guildford & Walton spas, we offer the perfect remedy to help either of these ailments. Aveda professional eye treatments are 15 minute add-ons to our facials (or massages!) to really boost your eyes to make them vibrant and glowing with health. 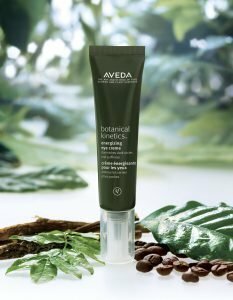 The Restorative professional Aveda eye treatment (£20) is deeply relaxing massage based eye treatment, specifically for reducing the appearance of fine lines and wrinkles. It features the ayurvedic marma therapy, where specific pressure points around the eyes are gently pressed and massaged. A blend of our Tulasāra™ firm concentrate and wedding masque eye overnight cream are massaged around the orbital bone. Our Energising professional Aveda eye treatment (£20) is based on hydration and moisture. This is a fabulous treatment for puffiness and dark circles and uses the pressure point and cold therapy. A combination of botanical kinetics hydrating treatment lotion and botanical kinetics energising eye creme is massaged into the orbital bone, using warm gemstone rollers and masque brushes. Both of these treatments will completely transform the appearance of your eyes bringing them alive with vitality once more.